Lake view Deluxe Condo sleeps 8 persons and with owner's approval may be 10 persons including children and infants 2,100 sq.ft 3 bedroom & 2 full bath Condo located in Building 10 which is next to the Clubhouse building. Luxury condominium elegantly and professionally decorated with high quality furniture and nice accessories -It is completely equipped, spotless and tastefully decorated, with all cooking utensils, linens and towels being top quality brands. Bedrooms:: Beautifully and newly furnished, this open floor plan home is tastefully designed with a Master Bedroom hosting a king-sized bed with all new bedding and an en suite. The second master bedroom also has a new king sized bed, and the third bedroom has 2 new full sized beds. All bedrooms have new flat panel HDTVs. This impressive Condo sleeps a total of 8 guests in beds with a queen sofa sleeper for 2 more and offers a Covered Lanai facing the lake to enjoy a great view and watch the fireworks from Sea World. Living, Dining & Den:: The Huge and Relaxing living area is all new as well. It boasts a great sectional with day bed , 50 inch flat panel HDTV, Play Station 2 and DVD player and free wireless internet in all rooms. There is a beautiful and tastefully appointed Dining Room table and chairs to seat 8 plus 3 bar stools at the kitchen bar. Check out the Den with a comfortable leather sleeper sofa to relax on and a game table where you can use any of the games we left for your entertainment with an extra HDTV and DVD. Don't feel like going out, no problem. Entertaining and cooking is a pleasure in this fully and newly furnished modern kitchen with stainless steel appliances and granite counter tops. With the open kitchen, the cook never misses out on any of the conversations and is able to share private time together with Friends and Family. 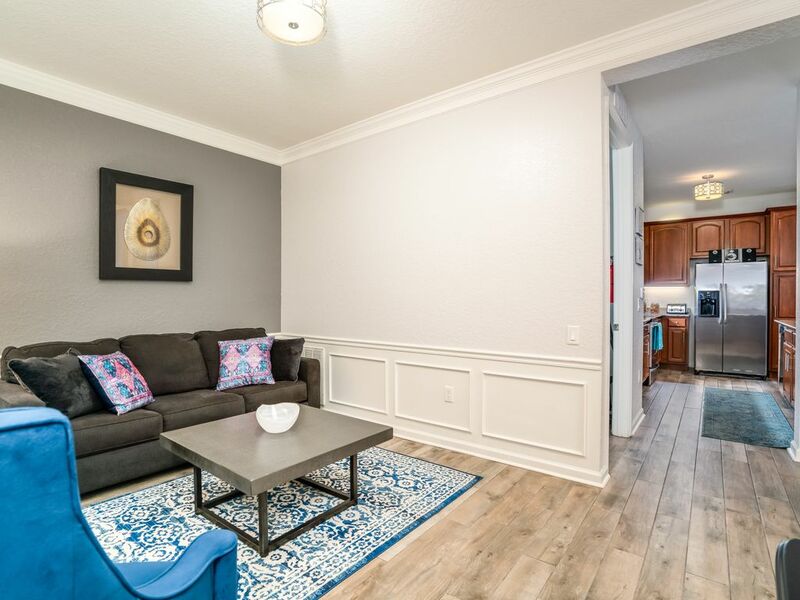 Other:: Condo amenities include: washer, dryer, towels, linens, coffee maker, fully stocked kitchen and all gourmet utensils to prepare a great meal, iron, ironing board, hair dryer and much more. The Tuscan themed community is located on Beautiful Lake Cay, next to the Convention Center and only a short distance from Disney World, Universal Studios, Discovery Cove, SeaWorld Adventure Park and the newest park, Aquatica. Vista Cay at is located just off Universal Boulevard and is at the center of some of Orlando’s greatest experiences. Vista Cay is ideal for the family wanting to be close to all the Excitement of International Drive and the Attractions, couples getting away for a while or for the Business Travelers in town attending the Orlando Convention Center. Great condo! Has everything you need and has a nice layout. We were some impressed by all of the amenities. We have stayed in a few other condos at Vista Cay but none of them were as well equipped. Lots of dishes, glasses, kitchenware, storage space, just great. Beds and furniture all nice and comfortable as well. Location is ideal right beside clubhouse and on the lake. We loved our stay! Left snowy Massachusetts to visit sunny Orlando in February. This was a family vacation of 4 adult children and parents. We were all impressed with this condo. It was very roomy and inviting. The space was beautifully decorated and meticulously maintained (which is very important to me!). The beds were very comfortable - just like home. The condo supplied us with everything we needed to make hearty breakfast each morning before we were off to visit Disney, Universal and Kennedy Space Center. Some family members stayed back and really enjoyed a day at the pool. We would definitely stay in this condo again without hesitation. Everything was exactly as described! the condo was very nice, plenty of room, as advertised. The pool was nice and it was great there was a bar at the pool that had reasonably priced drinks and cocktails. The condo is close to Universal and many options for restaurants and close to the outlet mall. We would stay here again. Four Ohio moms enjoying a long weekend in Orlando! We had an amazing time in the condo and in Florida! We loved staying in this beautiful and very comfortable home. it was clean and beautifully decorated. The beds were very comfortable. The view out to the lake is gorgeous. The kitchen is fully stocked with plenty of high quality dishes, pots, etc. Check-in and check-out were very easy. We would definitely love to stay in this beautiful home again! This is a great condo to stay at! Everything was clean and in working order. It is decorated really nice! The unit itself is located right next to the pool and gym. The resort is right next door to a Publix. Monica was extremely helpful when we had issues with the lock in the unit. *next to Orange County Convention Center, the second largest in the nation. *Walt Disney World Theme Parks - 13 miles. *Wet and Wild Water park - 1 mile. *Universal Studios - 3 miles. *Islands of adventure - 3 miles. *Sea World and Aquatica - 1.8 miles. *Pointe Orlando with cinemas, Dining, Shopping and Entertainment - 1 mile. *Orlando Intl. Airport - 9 miles. *Florida Mall and Premium Outlets - 5 miles. *Downtown Orlando - 12 miles. *next door to a Publix super market. *Shingle Creek Golf Course - 1 mile.